While kitchen interior design is often carried out with more utilitarian or entertainment-oriented functions in mind, there is no need to turn your back on a breathtaking view. 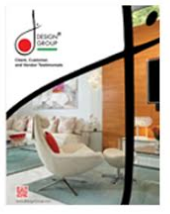 In fact, J Design Group can often plan and implement your kitchen remodeling project around your home’s view. From layout to silhouettes to textures, we know just how to make your kitchen flow into your natural view or use these to have your view vibrantly pop. So, whether you overlook the majestic Atlantic Ocean, the calm beauty of Biscayne Bay, the spicy glamor that is Miami Beach or even your own fabulous landscaping, here are a few ways a kitchen interior designer can highlight the nature right outside your window. One of the last things typically thought of – and often completely forgotten – during the kitchen design process is how the layout of the room needs to be oriented to the view. Sinks, cooking ranges and seating should all be optimally relocated near your view or overlooking it. Prioritize by the station you and other people in your home will be spending the most time. After all, what good does such a spectacular landscape do, if you constantly have your back turned on it? Obviously you wouldn’t want to have large items like refrigerators or upper cabinets to block your view. But often kitchen views come from open floor plans and the windows are actually located on living or dining room walls. In these cases, kitchen interior designers will also have to look at the furniture and other items located in these rooms and asses whether or not these will spoil your kitchen view. All furniture in between your kitchen and the windows should have a lean silhouette or be low-slung. This way there is less of a profile distraction. If you have larger pieces that must remain in the space, move them out of the line of sight or turn them so the slimmest profile is showing. Heavy curtains can also be a distraction. One option is to simply go without and install hidden blinds or tinting. If you must have curtains or the design calls for it, go with slim modern panels or breezy sheer fabrics. To make your kitchen interior design a relaxing extension of your view, choose a color palate similar to the elements outside. An ocean view kitchen could pick up on the blues and tans for colors. Other textures and finishes, such as flooring or tile, could mimic driftwood, sand or ocean glass. Conversely, if you are really looking for your view to be more of an awe-inspiring vibrant natural painting, have your kitchen interior designer work with more contrasting colors and finishes. For example, working with that same ocean view, try contrasting it with yellow or red walls. 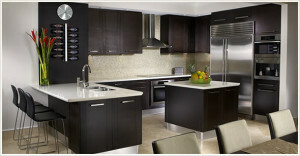 Likewise you may choose more modern finishes and textures, or darker wood. Another way to harmonized your view and your kitchen design is to bring in living elements. Plants and fresh fruit work wonders for bringing the outdoors in. Accessorize with natural finishes and fibers.